When it comes to dessert, my boyfriend Erlend and I are on opposite ends of the spectrum. I’m a big fan of classic sweets like cakes and cookies, but he prefers desserts of more exotic fare. Things like Asian sticky rice desserts, or esoteric desserts like pavlova. When Erlend recently requested that I make a pavlova, I was a little bit confused — I’d never heard of the dessert before. So what is it, exactly? I like to think of it as a giant meringue, but softer. That is, although a pavlova shares the meringue’s hard shell, its inside are fluffy and soft like a marshmallow. According to my research (ehem, Wikipedia), pavlova is actually pretty common in Australia and New Zealand; you just don’t often see it in the US. The dessert was named and created for the Russian ballet dancer Anna Pavlova (known for her beautiful dancing), which I found unsurprising. The dessert is delicate, light, and airy — just as I imagine a ballet dancer would be. The result was a dream. 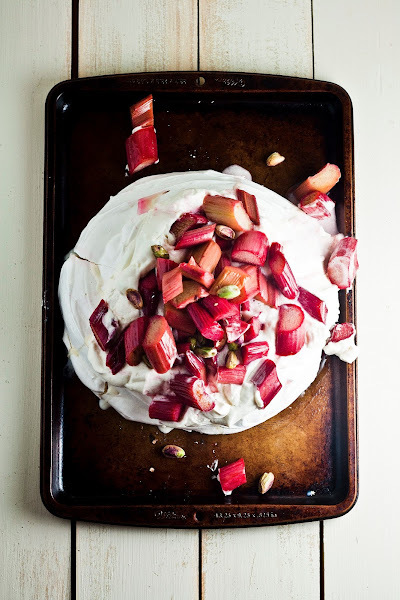 The rhubarb and pistachio pavlova was a beautiful balance of differing contrasts: the pavlova’s delicate, crisp exterior versus its soft, cloud-like interior. 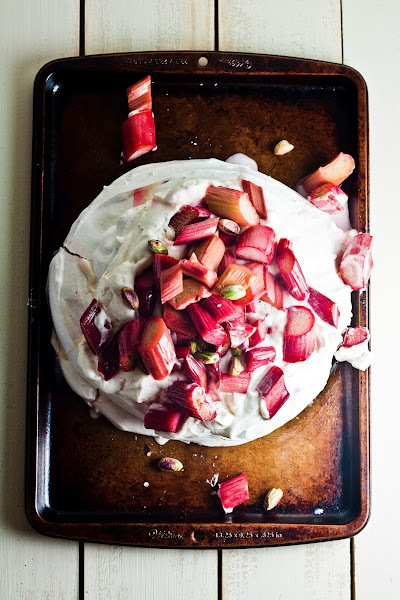 The rhubarb’s soft, tart texture versus the crunchy pistachios. When I was little, I always imagined that clouds in the sky were edible. In my head, I had pegged their texture and flavor as similar to cotton candy. But with this recipe, I found out that, nope, I was wrong this entire time. If you could touch and taste a cloud, they’d taste like pavlovas. Most likely. Despite the fact that pavlovas have a fairly short prep time, they also have a loooonnnggg baking time. This baby baked in the oven for 2 and a half hours. There’s no way around it — increasing the temperature will burn and unattractively brown the pavlova’s outer shell. Just plan ahead! 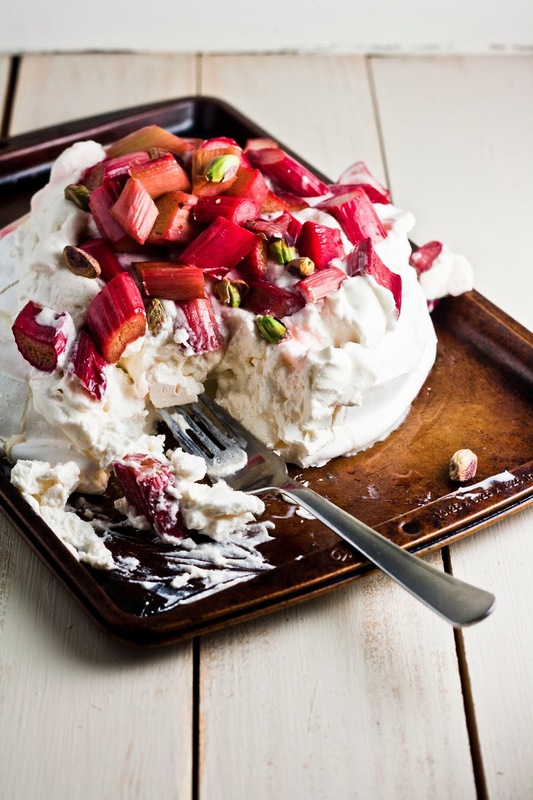 The pavlova can be made a day ahead of time and kept uncovered in a cool, dry place. If your pavlova starts to brown at any point during the cooking process, reduce the cooking temperature to 175 (F). But be careful not to check your pavlova too much — opening the oven door too much will cause too many temperature changes, and therefore cracks in your pavlova. Speaking of cracks, it’s important that the pavlova cools in the oven. The pavlova will deflate if exposed to cool air, causing giant cracks. 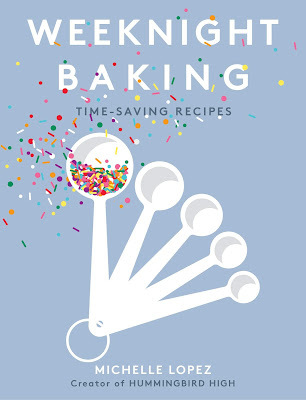 After the pavlova has finished its baking time, don’t even bother taking it out of the oven — simply turn off your oven, and allow it to fully cool down, preferably overnight. Again, it’s probably best to make your pavlova the night before you plan on serving it. I know people think cornstarch is kinda gross, but it’s actually really important in this recipe. The addition of cornstarch is what distinguishes pavlova from meringue, and is responsible for the pavlova’s soft, moist, and marshmallow-like center. Please don’t omit from the recipe, or you’ll end up with a meringue instead of a pavlova! Leftover decorated pavlova can be refrigerated overnight, but the dessert will absorb moisture in the fridge and lose its crispness. It’s best to eat it all in one go, unless you don’t mind soft meringue. Preheat the oven to 200 (F). Prepare a large baking sheet by lining with parchment paper. In a small bowl, whisk together 1 cup granulated sugar and 1 tablespoon cornstarch. Set aside. In the bowl of a freestanding electric mixer fitted with a whisk attachment, whisk together 4 egg whites, 1 teaspoon lemon juice, and 1/4 teaspoon kosher salt on low speed until very frothy. When the mixture is frothy, increase mixer speed to medium-high and gradually add the sugar and cornstarch mixture (from the second step), beating until stiff, glossy peaks form, about 12 to 15 minutes. Be sure to scrape down the sides of the bowl with a rubber spatula halfway through the mixing process. 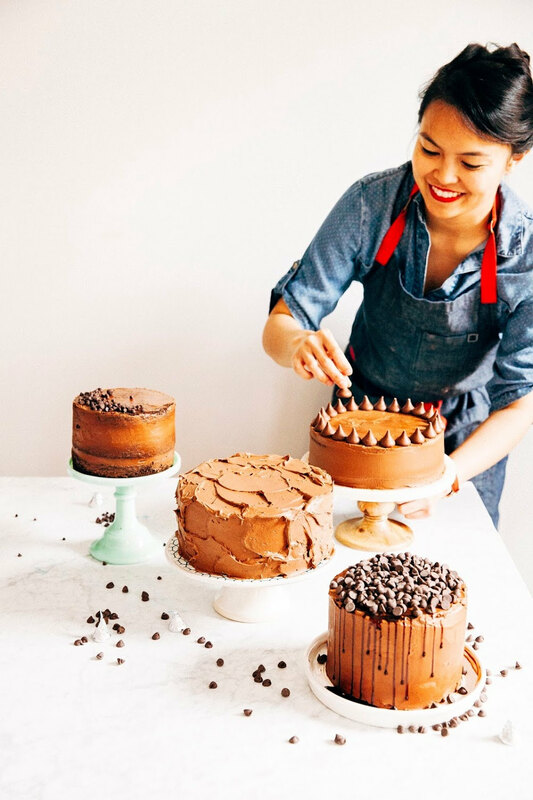 When the mixture is glossy and stiff, use a rubber spatula to mound onto the center of your prepared parchment sheet. Use the rubber spatula to spread the mound until it is a 7-inch circle, and create a well 3 1/2-inches wide and 1-inch deep in the center of the mound. Transfer to the preheated oven and bake for 2 1/2 hours, or until the mound is crisp on the outside and soft inside. When the pavlova is ready, turn off the oven heat and let the pavlova cool in the oven for at least 2 1/2 hours, or until completely cool (preferably overnight). In a medium bowl, toss together 1 pound sliced rhubarb, 1/4 cup water, 3/4 cup granulated sugar, 1 tablespoon lemon juice, and 1/8 teaspoon salt. When the rhubarb is covered, transfer to a 9 by 13-inch glass baking dish and bake until just tender, 10 to 12 minutes. Use a rubber spatula to carefully transfer the rhubarb pieces (they will be very soft) to a parchment-lined rimmed baking sheet; reserve the juices. Allow both the rhubarb and juices to cool completely. When the rhubarb has cooled and you're ready to serve your pavlova, make the vanilla whipped cream by combining 1 1/2 cups heavy cream and 1 teaspoon vanilla extract in the bowl of a freestanding electric mixer fitted with a whisk attachment. Whisk on medium-high speed until soft peaks form and you have whipped cream. Once the whipped cream is ready, transfer to the pavlova well. 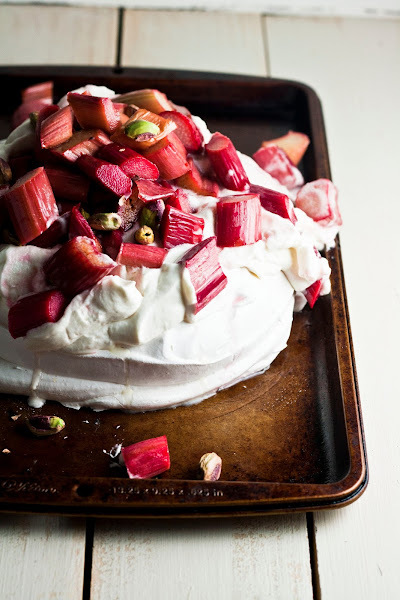 Top with rhubarb and garnish with 1/8 cup pistachios. Spoon over rhubarb juices and serve immediately. That is super stunning! I have wanted to try making pavlova for the longest time! 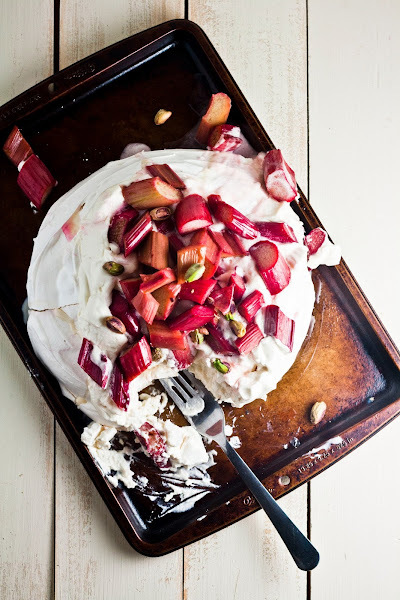 What a beautiful way to use rhubarb! Wow what a beautiful looking pavlova, I really love the photos and the idea.